The little princess of the blogosphere, Sati, Pehpot’s daughter, celebrated her first birthday at Jollibee Roosevelt last Saturday, November 6, 2010. 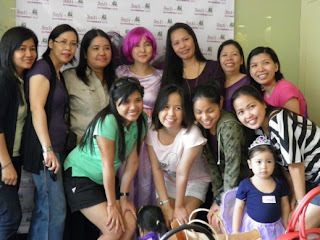 Kids came in Tinker Bell, Peter Pan and pirate costumes, while moms had to wear anything purple, pink, brown, or green. That’s my son over there! He won the best pirate costume! There was a lot of food served during the party. Most, if not all, of the guests even went home with take-outs. Now, that’s a party to remember! Everyone went home with smiles on their faces. Thanks again, Peh, for inviting us! This entry was posted in Birthday Party, First Birthday, Jollibee, Sati. Bookmark the permalink. 4 Responses to Sati Turns 1! wow, congratz 2 ur little Captain Hook. the kids must have enjoyed the party…and, mommies, too. great bonding… some familiar faces (on blogland). wow!! that was really SOMETHING.. happy birthday, SATI!